There are lots of things to organize and keep straight during your pregnancy. Use a simple pregnancy calendar to help you keep track of appointments, baby milestones, events, and observations during the weeks of your pregnancy. To print and use this weekly pregnancy calendar, first click on the image to download it to your computer. If you need help on downloading an Adobe PDF document, read these instructions. Print a page for each week of your pregnancy in landscape orientation. Write in your due date, the week of your pregnancy, and the month and year as indicated on the first line of the calendar. On the second line, fill in the date of the month for each day of the week. On the appropriate dates/days, use the next lines to record your important events, milestones, decisions, and pregnancy planning as suggested. Use the "Symptoms" boxes to note any bothersome symptoms and the "Notes" boxes to record additional information you want to record. Discuss plans for postpartum birth control with your OB doctor or midwife. As you complete each week, you can keep your weekly pregnancy calendar pages in a three ring binder to make a scrapbook. If you want to make a special scrapbook keepsake, try the following simple project. For each week, place the pregnancy calendar page in a sheet protector so that the top margin of the page faces the holes in the protector. 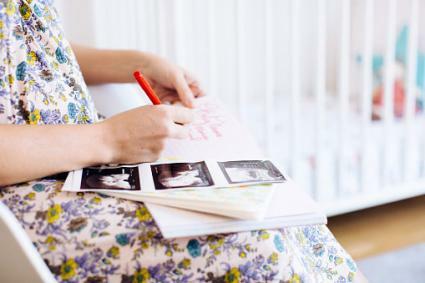 Take a sheet of printer paper and glue on any mementos for that week you want to preserve, such as ultrasound photos, greeting cards, letters, and baby shower photos. Make sure you only glue these items to one side of the paper. Insert the paper into the same sheet protector so that the glue-ons face the other side of the protector sheet with the smooth backs of the calendar and the printer paper together. Alternatively, you could choose to just drop the mementos into the protector sheet on the back side of the calendar page. Insert the completed sheet protector into the three-ring binder. Use stickers and rub-ons to decorate the front and back covers of your binder scrapbook. If your mementos for a week cannot fit on one sheet of printer paper or in one sleeve protector, use another paper and protector sheet and follow steps 2 and 3 above. Place this protector sheet in the three-ring binder after the corresponding week's calendar protector sheet. This simple weekly pregnancy calendar makes it easier to keep track of the multiple appointments and other essentials during your pregnancy. Preserve the pages as a record of your journey so you can share it with your child.